The P3 Conference continues to live up to its reputation as the premier event in the P3 calendar. AIAI was proud to be a visibly active co-chair of the event. 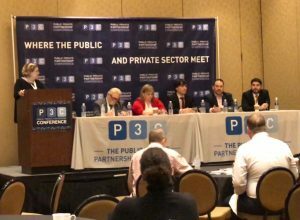 Attendees brought enthusiasm and energy to the P3 Conference, with public officials passionate in their pursuit of P3 understanding, and private sector delegates eager to share insight and experience from their own P3 stories. From a ‘sellout’ attendance at AIAI’s P3 Questions & Answers breakfast, to a myriad of topic-specific panels, AIAI members played a major part in strengthening not only the P3 message, but AIAI’s reputation as the leader in P3 education and advocacy. AIAI’s active presence was built around three key initiatives: the P3 Questions? P3 Answers booth, our interactive workshops; and a stellar series of panels featuring AIAI member experts. These were all instrumental in showcasing AIAI as the P3 resource leader. Our members’ enthusiasm and willingness to lead the way were key factors in making each of these a success. The concept of P3s can be complex and intimidating. It was the goal of AIAI to encourage open, frank dialog between our industry experts and the public sector. We hosted a series of P3DIRECT events in order to maximize the potential reach to both our members and the public sector. This allowed for lively discussions of real world challenges for professionals wishing to learn more about P3 as a successful, tested alternative delivery model for infrastructure. What did you think of the 2018 conference? Click here to let us know! Sunday night’s Welcome Reception was an ideal opportunity for public officials to engage with AIAI members in an informal setting, and to enjoy cocktails, locally made gelato and the now legendary mashed potato bar. 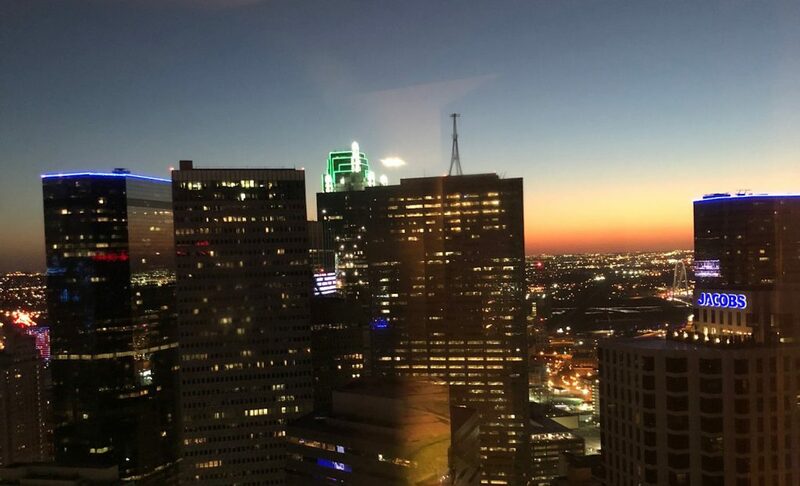 The Chaparral Ballroom on the 38th floor provided the ideal setting, with amazing views of Dallas as the sun set. This year our Members and Invited Guests gathered at Eddie V’s to enjoy an evening of good food and wine and even better conversation. As AIAI membership grows, so do events like these as we showed our appreciation to over 60 guests with gratitude for their work and enthusiasm toward the common goal of moving P3s forward. AIAI Board Member Joe Wingerter speaks to the packed private room. THE KEY TO ALL WE DO IS QUALITY EDUCATION. AIAI MEMBERS DELIVERED IN A VARIETY OF WAYS! AIAI hit the ground running with our Pre-Conference Workshop designed specifically for public sector participants. The interactive nature of the discussion, through the ability to text questions anonymously to the screen, allowed the audience to steer the conversation towards the topics they most wanted to discuss. This proven strategy once again led to a packed room and lively discussion. Moderated by AIAI’s Education Chairperson Sallye Perrin from WSP, the panel was led by Seth Miller-Gabriel, OP3DC, Bryan Kendro of Star America, Ryan Prince from John Laing, Lee Weintraub, Becker & Poliakoff, and Kiewit’s Joe Wingerter. 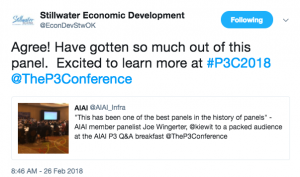 As Joe Wingerter left the stage, he remarked, “This has been one of the best panels in the history of panels!” and this sentiment was echoed in a retweet by representatives of Stillwater Economic Development. 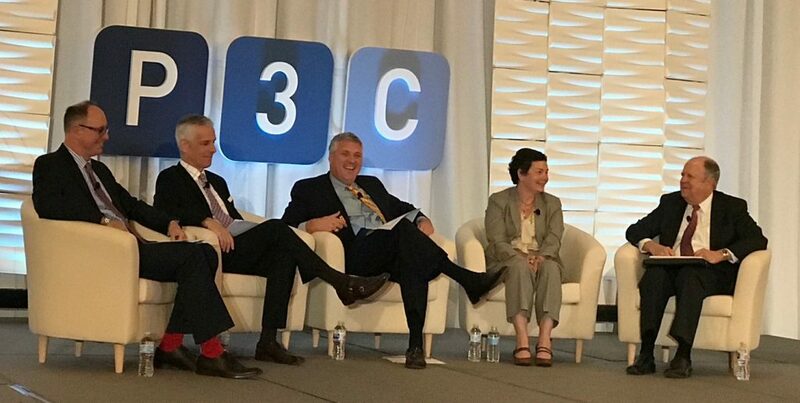 This panel discussed the need to create a RFQ roadmap for procurement, with a focus on understanding the risks, capturing the vision and the need for clarity to achieve success. Perhaps contrary to expectation, the world of P3s and infrastructure is well represented by women in all aspects of the industry as was demonstrated by this stellar panel. 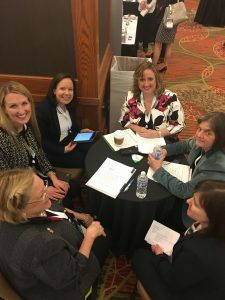 Moderator Sallye Perrin, WSP, led the discussion which included Angela Clayton, Plenary Group, Angela Payne, JMW Consultants, Stephanie Wagner, Mayer Brown, Heather Walker, Cintra US, and Flour’s Andrea Warfield. “I’m actually thankful that I attended this panel, because I was done with my RFQ, but I think I have to go back in and readdress some parts of it” – Shared by a public sector participant who visited the AIAI booth for further information. Another tweeted, “Halfway through – I realized the panel was comprised of all women”. AIAI #P3Professionals! Paul Monte, Peckar & Abramson moderated a panel of industry experts who make their living balancing and managing risk. Jack Callahan, CohnReznick; Daniel Filer, Ferrovial Agroman; Karla Pascarella, Peckar & Abramson; and Carol Stark, Aon spoke from the design builder’s perspective. 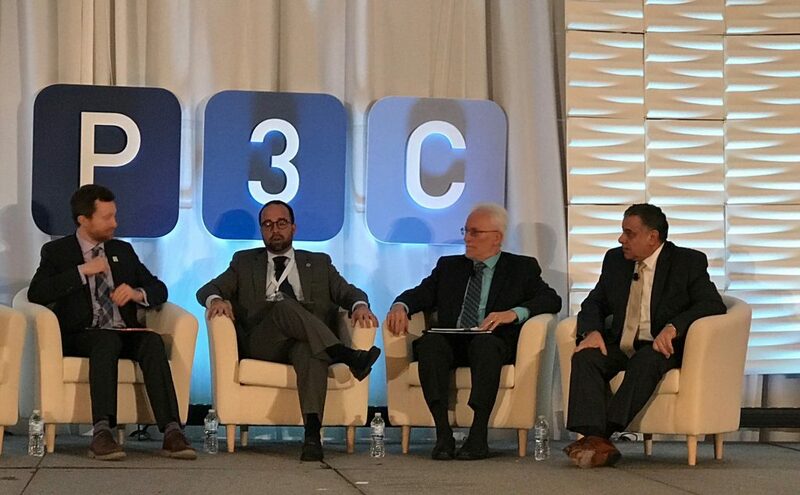 In this panel, owners had an opportunity to define their P3 requirements and share their experiences, lessons learned and the opportunities that lie ahead. Seth Miller Gabriel, OP3DC moderated the panel with Sam Beydoun, Illinois DOT; Joe Carpenter; Georgia DOT; and Omar Marrero, Puerto Rico PPP Authority. Perhaps misunderstood in early negotiations about collaborations to develop public works, risk is now being embraced as a critical element of innovative and accelerated project delivery. Jodie Misiak, WSP shared her perspective, highlighted by observations from Star America’s Mark Melson, and Alistair Sawers, TranSystems, to describe ways in which risk is taking center stage. John Friel of HNTB offered the point of view of public agency owners who understand and appreciate the effective transfer of risk and cost considerations which impact complex projects. Gregory Johnson of Squire Patton Boggs moderated the dynamic panel, with Mike Fay of Zurich North America offering the detailed ways in which risks are taken into account in terms of both due diligence before and then actual delivery of America’s infrastructure. 7.30am breakfast – Procurement Readiness and Best Practices welcomed early risers to an invaluable discussion on procurement practices. Sidney Florey of Vinci Concessions, Stephanie Wagner from Mayer Brown, TranSystems’ Alistair Sawers, Bryan Kendro of Star America Infrastructure Partners and Morteza Harajian from VDOT compiled this panel, moderated by Sallye Perrin, WSP and chair of AIAI’s Education Committee. The participants appreciated the group’s candidness and direct approach to responding to the topics and questions that were of interest and concern them. Did the gloves come off for the hotly-debated topic of traditional bond financing vs P3? The Cost of Capital Cage Match highlighted the importance of taking into consideration risk allocation and how it shapes public works delivery. Rodney Moss of Hunt Companies refereed the spirited debate between Michael Palmieri, P3 Point, Cintra’s Anthony Elkins, Mary Francoeur from PFM, and George Milliford, Hilltop. The panel really addressed the heart of the matter and demonstrated the importance of valuing risk in project delivery, leaving the crowd eager to learn more. “I was especially entertained and informed by the exchanges involving the participants who got READY TO RUMBLE! when debating the Cost of Capital during the Cage Match. The brief introduction video and the wrestling nicknames kicked off the session with a totally different feel than most conference panel discussions. However, the conversation was especially enlightening.” Tad Gulesarian, Hunt Companies. AIAI once again wrapped up the conference with the closing session: P3 Questions? P3 Answers – What Are The Next Steps – Where to Go from Here? Public sector participants had the opportunity to submit additional questions that the conference brought to light for public sector attendees to the panel and giving our members and AIAI another opportunity to share best practices with the audience. Matt Neuringer from Ashurst moderated the closing panel alongside Sid Florey of Vinci Concessions, Bill Hvidt of The Hvidt Group, Tom Mulvihill, KeyBank, Acciona’s Luis Palazzi and Russell Zapalac of Halff Associates. Members were also involved in other panels: Steve Paquette of WSP moderated The Role of P3s in Resilience Projects. Skanska’s Fred Burman hosted Is There Value in Long-Term Partnerships through P3s for Small and Medium Sized Projects? and was joined by his colleague Farhad Soltanieh. 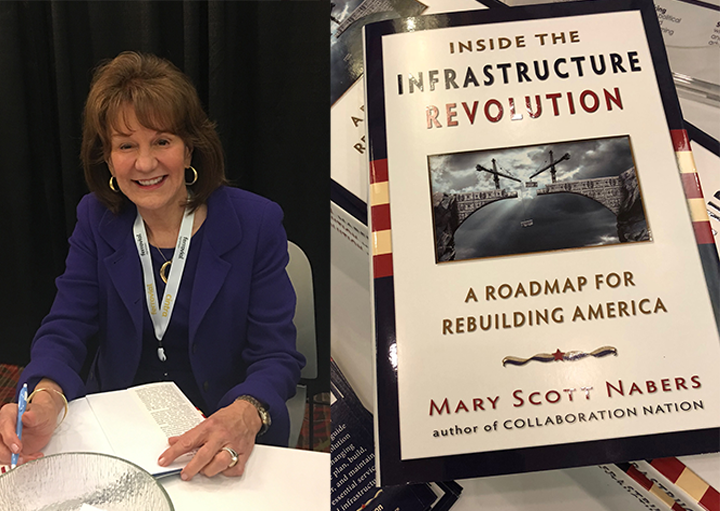 Mary Scott Nabers moderated Starting from Step One – a Roadmap to a Successful P3 and participated in Comprehensive Capital: Financing a Successful P3 Deal. KeyBanc’s Thomas Mulvihill joined the panel Risk Reward and Control for Higher Education Institutions. Angela Berry Roberson of Ferrovial and Denise Turner Roth from WSP discussed The Future of P3s – Driving Diversity and Depth of the US P3 Workforce. Ali Altaha, C2PM; Eric Beightel, WSP; Carmen Best, Yacari; Sam Beydoun, Illiois DOT; Vincent Bouchery, Groupe ADP; Deborah Brown, WSP; Frederick Burman, Skanska; Jerry Burrows, Pillar, Inc.; Jack Callahan, Cohn Reznick; Duane Callendar, Build America Bureau; Cesar Campillo, Puerto Rico P3 Authority; Joe Carpenter, GeorgiaDOT; Larry Casey, Skanska; Derek Chauvette, KeyBank; Robert Chicas, HOK; Dan Dennis, Pillar, Inc.; Mark Devaney, Langan; Roddy Devlin, Squire Patton Boggs; Steve DeWitt, ACS Infrastructure Development, Inc.; Jonathan Dingle, Meridiam; Peter Donahue, WSP; Jennifer Bales Drake, Becker & Poliakoff; Tony Elkins, Cintra; Morteza Farajian, VDOT; Michael Fay, Zurich NA; Daniel Filer, Ferrovial Agroman; Neal Fleming, Edgemoor; Sidney Florey, Vinci Concessions; Andrew Fraisier, Ashurst; Niklas Franck, Skanska; John Friel, HNTB; Bruce Gabriel, Squire Patton Boggs; Seth Miller Gabriel, OP3DC; James Geer, Kiewit Development Company; Sam Gilmore, Kiewit Development Company; Judah Gluckman, OP3DC; Quinn Gormley, Cohn Reznick; Tad Guleserian, Hunt Companies; Adam Hesketh, Transurban; Bill Hvidt, Hvidt Group; Gregory Johnson, Squire Patton Boggs; Noah Jolley, ACS Infrastructure; Mark Kempton, Skanska; Bryan Kendro, Star America Infrastructure Partners; Olivier Larzul, Peckar & Abramson; Sue Lee, EY; George Leventis, Langan; Joe Lewis, Business Transformation Group; Monica Lewis, Business Transformation Group; Bartley Livolsi, Citi; Marshall Macomber, Think P3; Amando Madan, Skanska; Ryan Marcelo, Meridiam; Belen Marcos, Cintra; Omar Marrero, Puerto Rico P3 Authority, William Marino, Star Infrastructure Partners; Mark Melson, Star America Infrastructure Partners; Jodie Misiak, WSP; Paul Monte, Peckar & Abramson; Rodney Moss, Hunt Companies; Thomas Mulvihill, KeyBank; Chris Mukai, Citigroup; Mary Scott Nabers, Strategic Partnerships, Inc.; Henry Navnitlal, Kiewit; Matthew Neuringer, Ashurst; Jose Maria Ojeda, Roadis; Luis Palazzi, Acciona; Steve Paquette, WSP; Angela Payne, JMW Consultants; Mary Jean Pethick, Zurich NA; Sallye Perrin, WSP; Anthony Phillips, John Laing; Ryan Prince, John Laing; Anne Rabin, HOCHTIEF; Angela Berry Roberson, Ferrovial Agroman; Denise Turner Roth, WSP; James Rubin, Meridiam; Alistair Sawers, TranSystems; Yava Scott, Yacari; Joseph Seliga, Mayer Brown; Brian Shell, WSP; Ryan Smith, HALFF Associates; Tara Smith, Miami-Dade County; Farhad Soltanieh, Skanska; Geoffrey Stricker, Edgemoor; Fred Tallerico, WSP; David-Olivier Tarac, Groupe ADP; Stephanie Wagner, Mayer Brown; Heather Walker, Cintra; Andrea Warfield, Fluor Enterprise; Lee Weintraub, Becker & Poliakoff; George Williford, Hilltop: Joe Wingerter, Kiewit Infrastructure Group and Russell Zapalac, Halff & Associates. The P3 Conference may be over, but the real work is just getting started! Coming down the pipeline we have our P3DIRECT webinar series, Illinois P3 Workshop, P3 Hub MidWest and the P3 Water Summit – and don’t forget to save the date for the P3C 2019 – March 4-6 2019. If you know anyone who would benefit from membership of AIAI, please spread the word! They can learn more about joining us here.